John Dillinger: [nodding at money left by a bank teller in front of his booth] You can put it away. Not here for your money. Here for the bank's money. 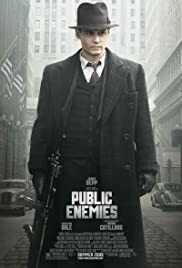 Q: When does Public Enemies take place? Q: Did any of Dillinger's associates survive? Q: Is "Public Enemies" based on a book? Digital is the world of Michael Man with all its drawbacks. It works up to a point, if you don't mind being distracted by the make up on the actors faces, pimples and blemishes. 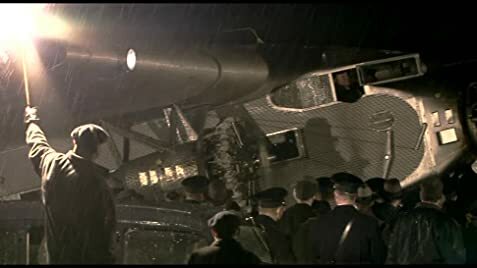 The final adventures on John Dillinger's life look and feel like a work of fiction and I suspect that in "Public Enemies" they are, 50/50, fact and fiction. Johnny Depp is marvelous no matter what and his is a star performance. There is only a vague approach to a real characterization, but I didn't care because I go wherever Johnny Depp wants to take me. It was like that with Gary Cooper too, wasn't it? Part of the sneaky narrative is to have Dillinger the criminal played by the angelic Depp and Purvis the noble FBI guy played by Christian Bale that emanates evil without even trying. If you're interested in performances, like I am, Billy Crudup is the thing in a sensational turn as J Edgar Hoover in spite of the digital thing, that makes him look as if Hoover suffered from some rare skin condition, damn shame if you ask me. Marion Cottillard is absolutely lovely but we knew that already and the rest of the characters remain an enigma, they enter and leave the scene without us ever having a clue who they are. Giovanni Ribisi, Stephen Dorff, Jason Clark, who were they and Lelee Sobieski? It was startling to see her appear on the third act. Who was she suppose to be? In any case, the film has a Michael Mann feel and it's technically great. The shootings are extraordinary and Johnny Depp totally beautiful. I suppose that should be enough to applaud and recommend "Public Enemies". I did and I will even if, I must confess, I expected more or maybe less. 135 of 237 people found this review helpful. Was this review helpful to you?